The NASTAR Handicap Chart is used to award medals, place participants in their appropriate Racer Division and award team points. Each time a participant races NASTAR, they earn a handicap which represents the difference between their race time and the Par Time expressed as a percentage. It's easier than it sounds - if a participant earns a 15 handicap, they are 15% behind the Par Time. For example, if the Par Time is 23.00 seconds and your time is 26.45 seconds, you are 3.45 seconds slower than National Pacesetter or the Par Time and your handicap is 15. The NASTAR Handicap System gives ski and snowboard racers a simplified system to gauge their progress throughout the season and allows racers of all ages and abilities a means to compare their race results to other competitors across the country regardless of when and where they race. This is accomplished by establishing a National Standard for all races. The National Standard is the Par Time or the "0" handicap which every racer competes against when they race Nature Valley NASTAR. 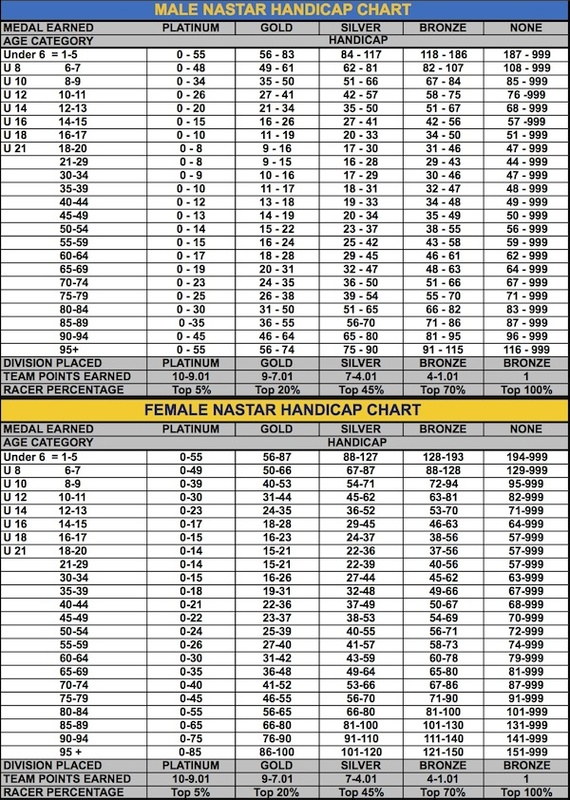 NASTAR participants earn a handicap each time they race which represents the difference between the racer’s time and the Par Time expressed as a percentage. The "0" handicap or Par Time is set daily by the hosting resorts’ Pacesetters. Each pacesetter has a certified handicap which is used to set the Par Time for their course.